The costs of government seem to grow exponentially, but some increases raise the eyebrows of even the most seasoned analysts. 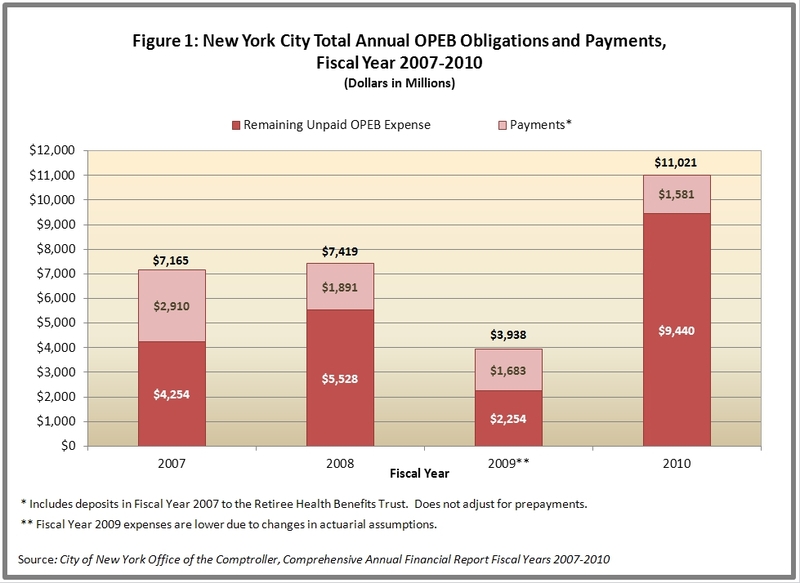 According to the Comptroller’s latest annual report in fiscal year 2010, New York City recognized a $9.4 billion expense for “other postemployment benefits” (OPEB), an accounting term of art that refers to the liabilities related to providing health insurance benefits for retirees. The $9.4 billion is a sharp increase from the $2.3 billion incurred the year before. Where did the huge added expense come from? Most of this increase was driven by new laws adopted at other levels of government: the federal health care reform law of 2010 mandates that young adults be allowed to stay on their parents’ health insurance until the age of 26, and New York State enhanced a program offering health insurance coverage to former employees (known as “COBRA benefits” because they were initially authorized under a federal Comprehensive Omnibus Budget Reconciliation Act). What can City officials do about the growing expense? While the new laws are outside the City’s control, municipal officials have options for controlling their fiscal impacts: they can require greater retiree contributions toward health insurance premiums, and they can establish a program for funding the future liabilities. Given the looming budget gaps and service cuts, the City should exercise these options now. The City of New York offers its employees a generous benefit package that includes comprehensive health insurance during and after employment, as well as a defined benefit pension. Generally, retirees qualify for the health insurance benefit if they have ten years of service, worked a minimum of 20 hours per week and receive a pension. Unlike most other large local employers, the City offers its retirees health insurance at no cost to the retirees. In addition, the City reimburses for the full cost of Medicare Part B premiums and provides additional benefits through contributions to union welfare funds. The cost of providing all of these health related benefits constitute the City’s OPEB liability. Retirees are able to enroll dependents, typically spouses but sometimes also children, at no additional cost to the retiree. Traditionally, children were covered until the age of 19 and were eligible to remain covered until the age of 23 provided they were enrolled in school full-time. Effective July 1, 2011, the national health care law will oblige the City to allow young adults to stay on their parent’s coverage until age 26, provided the child’s employer does not offer insurance. In November 2009 New York State adopted legislation extending eligibility for COBRA benefits. The federal mandate allows 18 months of coverage, but the State law extended eligibility to 36 months for workers eligible for COBRA as of July 1, 2009. Even though COBRA recipients pay the entire premium themselves, claims made by COBRA-covered individuals are usually 50 percent greater than for other participants, driving up average costs and the associated premiums paid by the City. OPEB-related costs have grown precipitously in the past few years. Retiree health insurance is funded on a pay-as-you-go basis, meaning that the City pays only the bill for premiums due in a given year; it does not fund the future obligation created by health insurance benefits promised to current employees when they retire. The latter cost is far greater than the former, but both are large and growing. Premium payments made by the City totaled $1.6 billion in fiscal year 2010 and are projected to grow to $2.4 billion by 2014. In comparison, the actuarially determined contribution needed for the City to fully fund its 2010 OPEB obligation is $11 billion. As the chart below shows, the City funds only a portion of the full costs incurred in any year, with large unpaid expenses accruing. Given the nature of the City’s workforce, the two major services generating unfunded OPEB costs are Public Safety and Education. (See Table 1 below.) The first category, including police officers and firefighters, accounts for about half the unfunded expenses. Uniformed retirees in public safety departments tend to be younger than other retirees, with one-third of fire retirees and almost one half of police retirees under age 60. The City is obligated to pay premiums for more years for these younger retirees, and they are more likely to have children eligible for coverage under the new federal provisions. The pension plans for police officers and firefighters that have no age requirement and permit relatively young retirement not only add costs for pension benefits, but also generate additional OPEB expenses. New York City has two tools for dealing with the growing OPEB liabilities. First, it can institute premium-sharing for retirees. Premium sharing can be collectively bargained with the Municipal Labor Committee and can be changed for current, as well as future, employees. The burdens of ballooning costs are too great for the City to bear on its own. An appropriate goal is for retirees to pay 50 percent of their premiums. Second, it should develop a policy for responsibly funding the costs. New York City was a leader in recognizing and beginning to fund OPEB liabilities. In 2006, the City established the Retiree Health Benefits Trust (RHBT) fund and deposited a total of $2.5 billion over fiscal years 2006 and 2007. Unfortunately the city has initiated annual drawdowns from the RHBT to help cover pension cost increases, thereby using the fund as a discretionary rainy day fund rather than a true trust fund for the designated purpose. The Mayor and the City Council should agree to a policy that determines the basis for future contributions and limits the conditions and purposes of future withdrawals. A New York State law allows children under the age of 29 to remain covered on their parents’ health insurance under certain conditions, but there is an additional premium cost above the normal family rate. This will change in 2014, when federal legislation will allow children under the age of 26 to remain on their parents’ health insurance even if they are eligible for their own employer-sponsored coverage. The City offers basic health insurance coverage through HIP and GHI. The City does not incur a cost for COBRA beneficiaries in HIP, but claims made by COBRA beneficiaries affect the experience rating under GHI through excess claims. For more information, see New York City Office of the Comptroller, Comprehensive Annual Financial Report for Fiscal Year 2010, p 99. Projection for FY2014 from City of New York Office of Management and Budget. Citizens Budget Commission. The Explosion in Pension Costs.